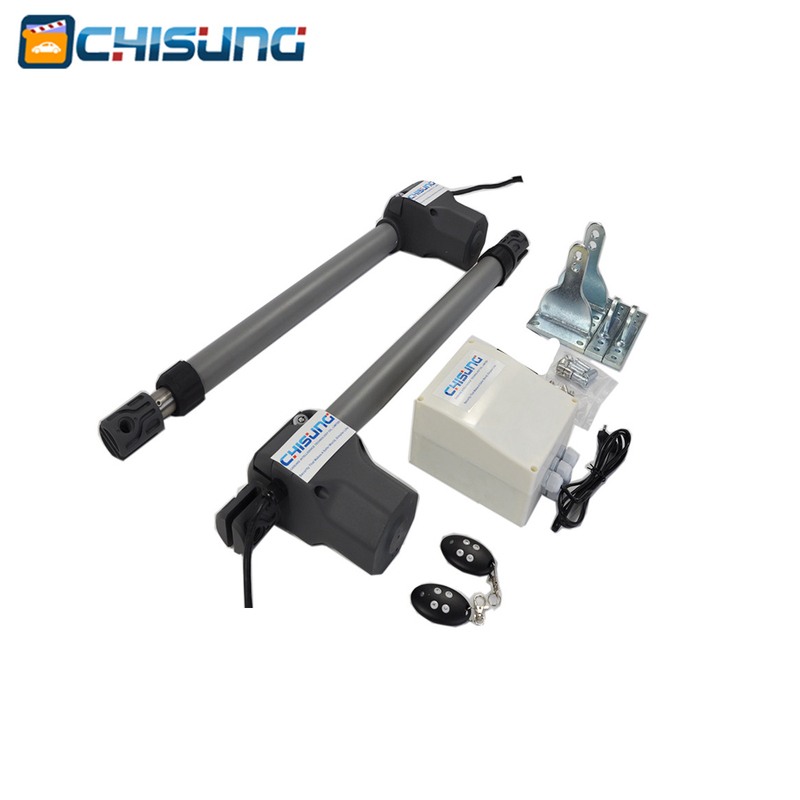 Dual Swing Gate Operator is designed for residential/commercial applications.Stay warm and dry in your vehicle.This Dual Swing Opener will handle dual swinging gates up to 5meter(2.5meter per leaf) in length and weighing up to 300KGS.Swing Gate Opener PKM-101 has a powerful 24VDC motors,which provide exceptional starting torque and features soft start/stop operation.This promotes longer gate and operator life,as well as dependable performance.All the gate openers supplied are pre tested and of good quality long lasting and have a 12 Months back to base warranty on the complete system. 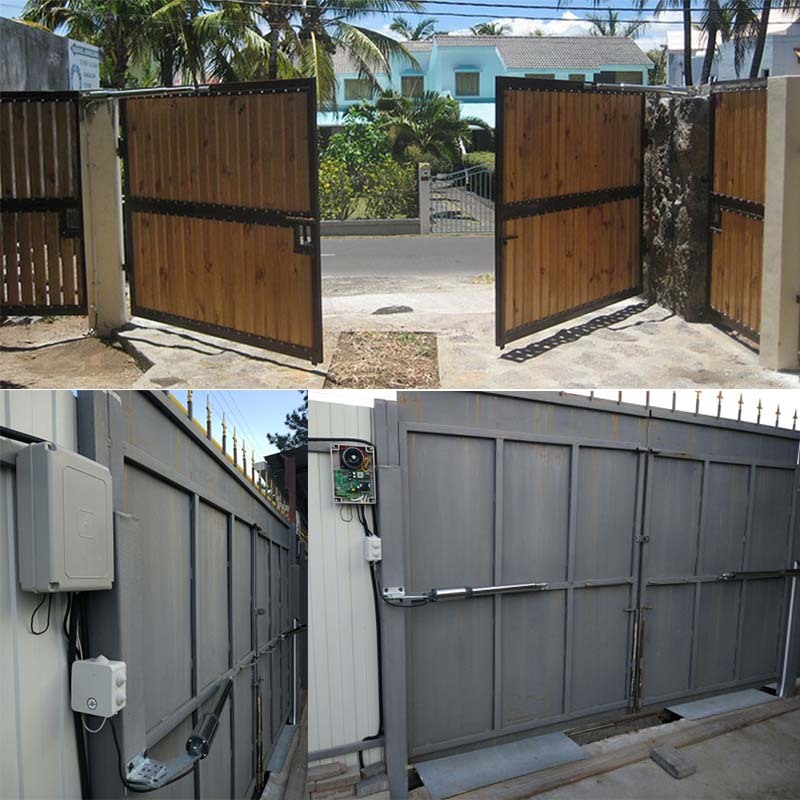 This dual arms swing gate opening system is a robust,tuff,long lasting,The motor can handle light gates.The PKM-101 swing gate operators is a sleek design telescopic linear screw type actuator that is made of stainless steel with a cast alloy motor housing.The two motors make are constructed of metal (no plastic, fibre or nylon). 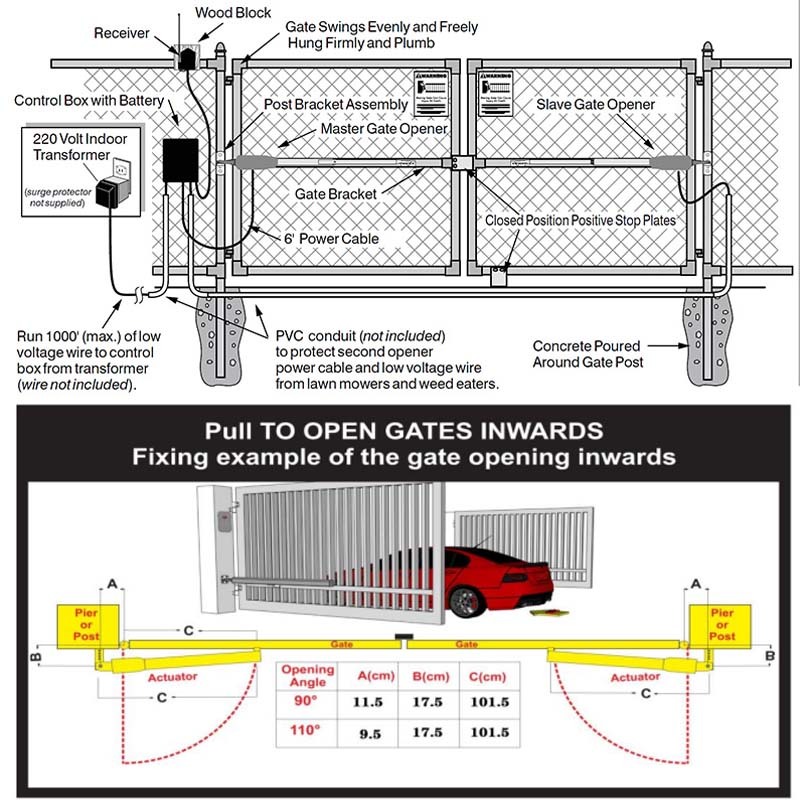 The PKM-101 swing gate opener is fitted with an emergency manual override on each actuator to allow the user to open the gates manually in case of an emergency such as a power failure situation. 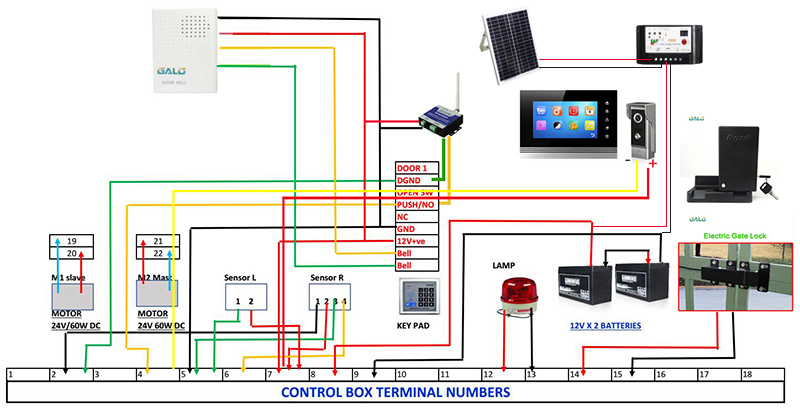 This is the basic package content, anyhow, for spare parts,like alarm light, photocells, push button, gsm door opener, if shown in photo clicked, it is included, otherwise, not included. 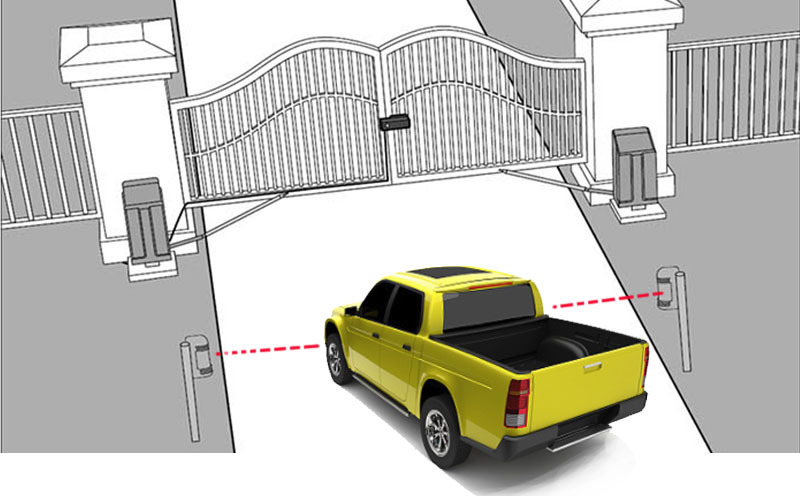 6.Adjusting residence sensitivity,Time promotation function.when open gate,speed is slow,then a little quick,and when close the door,speed is slow again. 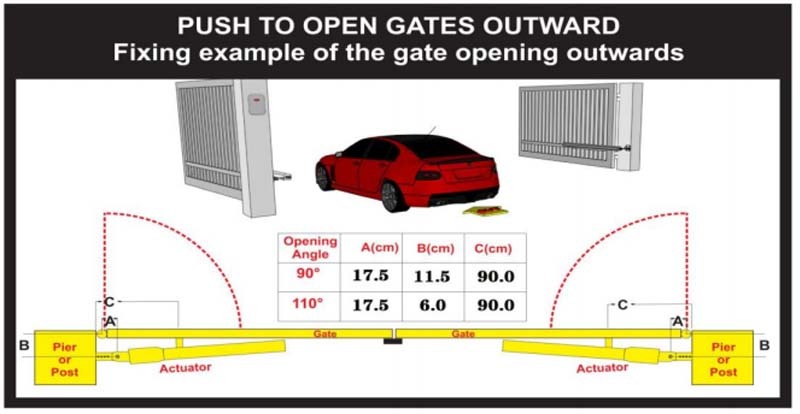 Aany question or you need DIY by yourself,please contact seller.If you are the installer of the gate, or your local dealer, welcome to contact the seller for cooperation, we deal at the best price. Solar panel, solar charge controller and back up battery can make your motor operate with out traditional power supply. 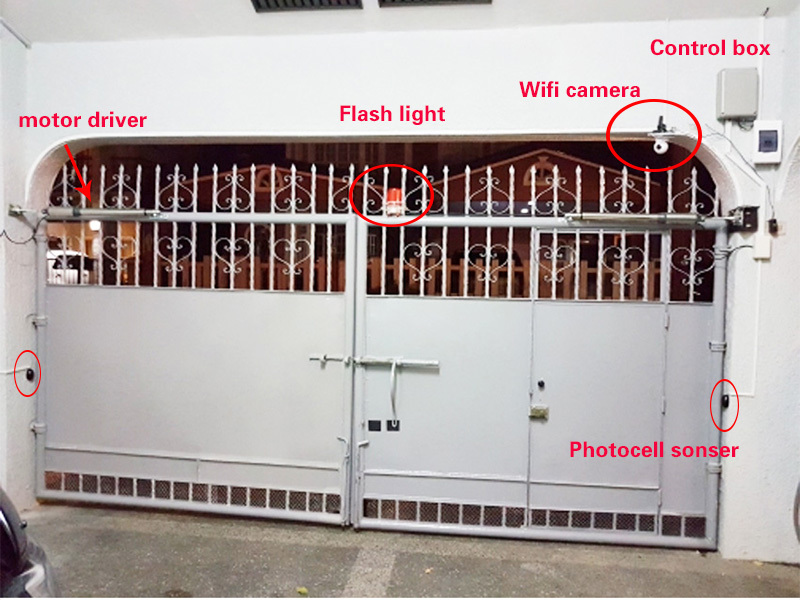 Wifi video doorbell phone,Wifi camera, 2G/3G GSM Controller:use for phone remote contrl gates opening. 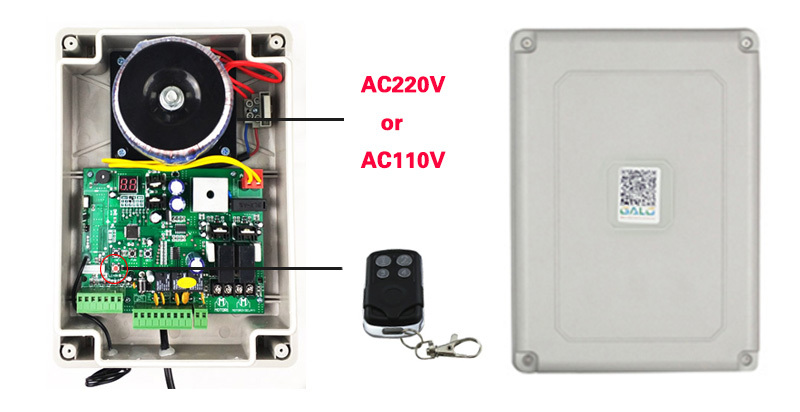 About the installation of the gate opener, it can be installed inside or outside the gate, all work ok.
1. 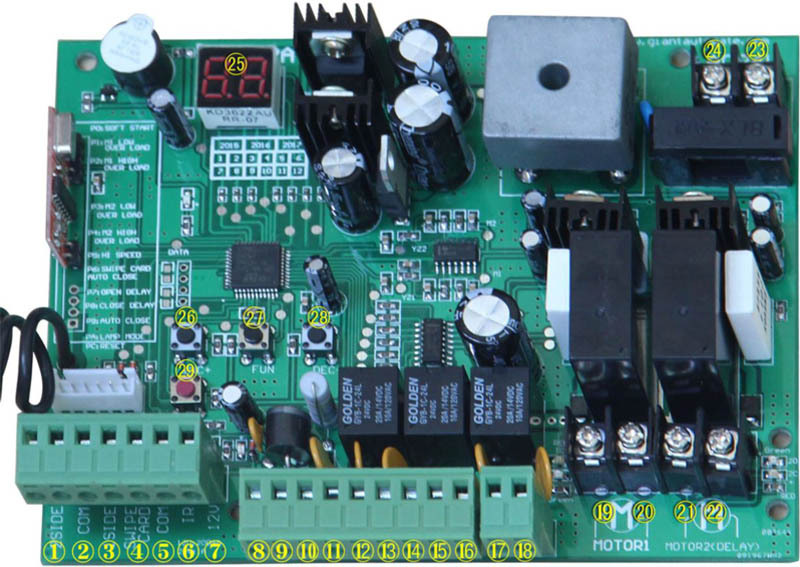 Control board can connect flashing light,and photocell,and back up battery,solar system,and keypad and so on. 2.Controlling single or dluble-leaf motor is optional. 3.Can adjust open and close door time. 5.High speed operate can be adjustment. 6.Set extra remote control is easily,up to more than 100pcs remote control. 7.As for remote control : button 1 is open,stop,close one gate,button 2 is for open,stop,close two gates. We accept Credit Card, Western Union, TT. , etc. You can choose a method which is best convenient for you. Payment must be made within 7days of order, if you can\'t check out immediately, please wait for a few minutes and retry. Normally, we will ship out the order within 3-5 business days after the payment cleared.Weekends or holidays will be postponed. Please make sure that your address is correct before payment. Please don\'t give us 1-3 low score on shipping, as we shipped the item quickly but the overseas shipping depend on many factors, such as logistic, weather, country policies, any problems, please contact us first. 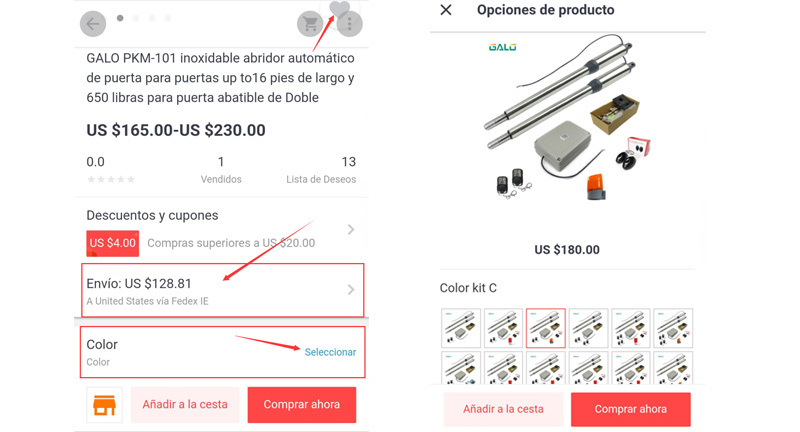 In order to ensure that you will receive your order without or less tax, we will declare it as "GIFT" with a lower value(Excluding valuables), The value doesn\'t reflect the total price you paid or the market value and may not apply to countries with different tariff rules. If you won\'t like to lower value declaration, please contact us or leaving messages in the order. If you want to purchase more, please contact us. Please contact us before leaving any negative or neutral feedback or opening disputes, we will work with you to solve any problems.